PHILADELPHIA — Bernie Sanders supporters made sure they were seen on Hillary Clinton&apos;s big night even though their candidate was counted out three days ago at the Democratic convention. Many delegates for Clinton&apos;s vanquished primary rival donned bright yellow, glow-in-the-dark t-shirts they hoped would stand out when the Democratic presidential nominee took the stage in Philadelphia on Thursday night. 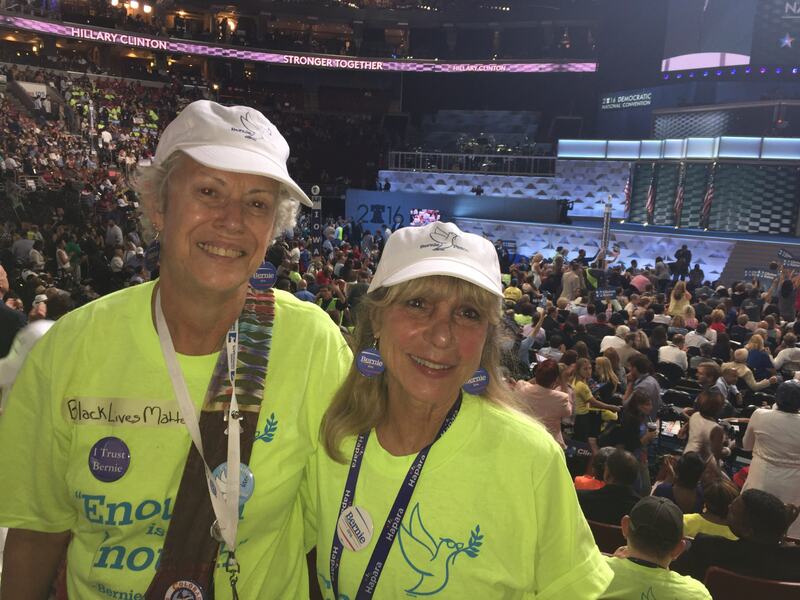 “We didn’t want to be forgotten this fourth day," said Nita Lynch, who is from Denver and came up with the idea with fellow Sanders delegate Cleo Dioletis. Lynch and Dioletis reached out to a vendor employing union workers (they made sure of that) to print up their slogan for the night: "Enough is Enough." Sanders repeated it often on the stump. She also thought her fellow Democrats could relate to the message, and interpret the phrase in their own way. The pair worked with Sanders delegates in the other 50 states to gauge interest, and ended up ordering nearly 800 shirts at $11 each. Standing out in the crowd was a respectful way to make their presence known, they said. Dioletis said she asked her delegation not to walk out or chant during the final night&apos;s proceedings. "We can’t change what is, but our shirts tell what we are saying,” Dioletis said. Joining in was former Rep. Dennis Kucinich, D-Ohio, who pulled on one of the shirts. Some decked out in yellow still were pretty vocal. Within the California and Alaska delegations, Sanders supporters waved "Ban Fracking Now" signs while chanting the same. Clinton supporters held up their blue and white "Hillary" signs and chanted that in an attempt to drown them out. Others held up signs that read "No more wars" when Retired Marine Gen. John Allen, a former commander of U.S. and international forces in Afghanistan, took his turn at the podium. Simone Pathé contributed to this report. Contact Bowman at bridgetbowman@rollcall.com and follow her on Twitter at @bridgetbhc . Get breaking news alerts and more from Roll Call on your iPhone or your Android.